Last week I talked about Legacy for the first time, and hopefully you purchased some of the Death & Taxes specs I recommended. Containment Priest, Rishadan Port, and Wasteland have already increased. By now you should have sold the Priests and Ports, but keeping the Wastelands for a higher price is a good idea. This week, rather than looking at the metagame of a specific format, I am going to explore something else—how understanding the mindset of online players can help you predict the next price increase. There are two types of players online: 1) Pros and competitive players; and 2) Ordinary players who just want to spend their free time playing some Magic online. We can make predictions based on both. First we look at the competitive players. This group of players will always play the best deck. For example, right now Nicol Bolas, the Ravager is the hottest card in Standard. Despite its high price tag, this group of players will still get their hands on copies of Bolas and do a bunch of testing with them. By understanding this type of behavior, we can buy those cards once we know they are good. The trick here is to watch a lot of streams and play a lot of Leagues—that’s the only way to know which cards are good before the 5-0 decklists are posted online! 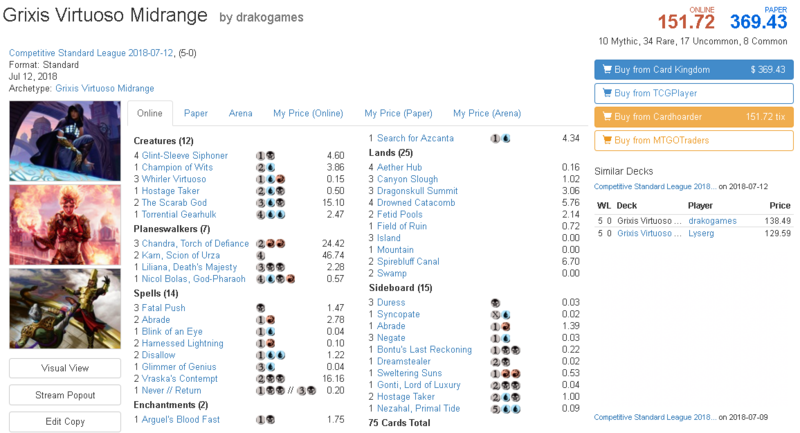 Bolas spiked hard when the first decklist was posted online, from 16 tickets to 26 tickets in just one day. If you spend enough time playing Leagues, even if you’re losing to the best deck, that’s still worth your time. In this case, you would have been able to see the power of Nicol Bolas firsthand and predict its subsequent price jump. When you can gain so many tickets from speculation, losing in Leagues won’t matter anymore! After Nicol Bolas, I predict that the Dragons deck with Sarkhan, Fireblood and Chandra, Torch of Defiance will the the next to become popular among competitive players. 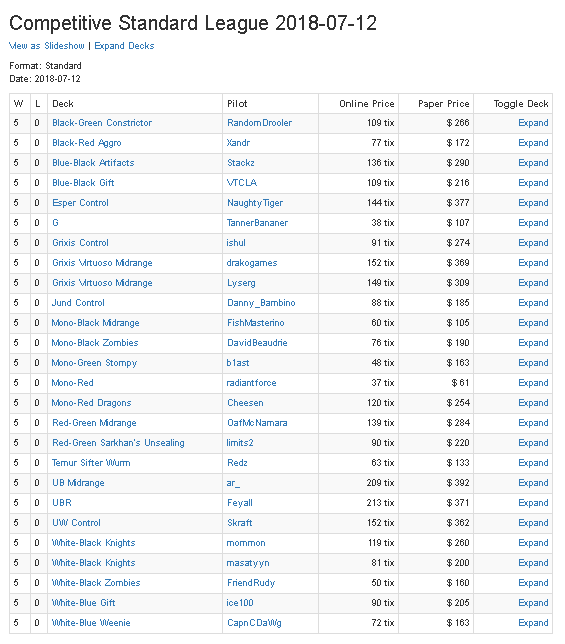 Let’s have a look at the prices as of now. Sarkhan, Fireblood is at the low-price stage of the trend I mentioned above. By now you should know that various Dragon decks, whether Mono-Red or Grixis, are abusing Sarkhan’s ability to cast Dragon spells while keeping mana up for removal or other stuff. Sarkhan also has the ability to filter draws, so that you won’t be stuck with a bunch of Dragons in hand while you can only cast one at a time. Chandra has been a great card in red aggro and midrange decks so far, but recently her price has dropped to a very low point. And now she is part of the Dragon decks and all other red decks. I’m expecting her price to increase again soon. Next we look at the other players on Magic Online. These players aren’t going to play the most expensive decks. They will observe the metagame before changing decks, and usually rely on decklists posted online. Most of the time, they will prefer to buy low-cost, but competitive, decks they can win Treasure Chests with. 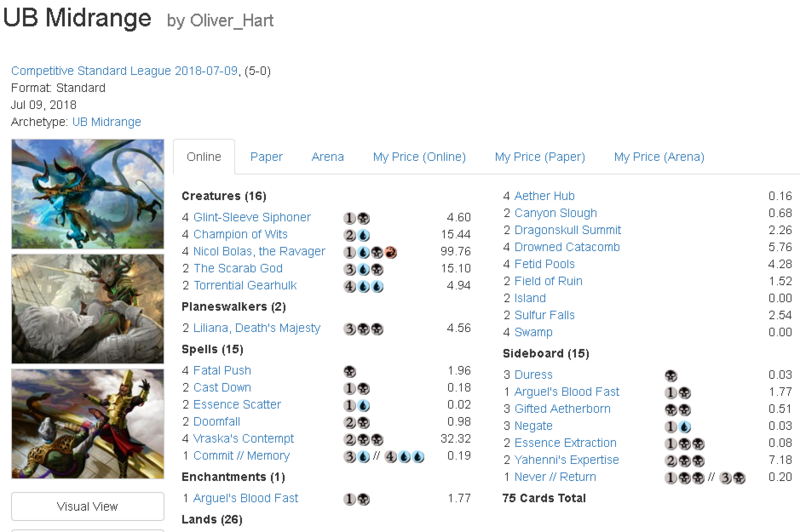 Let’s look at the decklists posted online on July 12th. Think of yourself as a budget/casual player who doesn’t have a lot of tickets for expensive decks. Which deck would you pick? Depending on budget, here are the decks that I would pick as a casual player. Note that the decks picked are just for me to describe about casual players’ thinking, and not for strategic advice. Sarkhan’s Unsealing is extremely strong in Draft, and players have begun including it in Constructed as well. This deck is an upgraded version of the earlier Green Stompy deck, and it’s pretty cheap to upgrade into this version. If we buy some Sarkhan’s Unsealing and other staples in this deck, and it performs well later, it may no longer be budget, if you know what I mean. This is a planeswalker control deck. Players who have played UB Midrange or Grixis Energy before will be attracted to this deck. Here we should target cards that weren’t in those two older decks, as they are the ones that will increase in demand. The planeswalkers are the cards you might want to invest in—especially Chandra, Torch of Defiance, as I mentioned above. This Mono-Red Dragons deck is for those players who cannot afford, or refuse to put hundreds of tickets into, a playset of Nicol Bolas. This deck is as good as the Grixis version in my opinion, and of course it’s cheaper. Think of it this way: if players want to play Dragons at minimum cost, this will be the deck to play. Furthermore, this is a deck that can be upgraded from the previous RB Midrange/Aggro decks. Currently, buying Sarkhan looks like a great opportunity to earn tickets. This deck has appeared in earlier 5-0 lists as well. Now that it’s showing up regularly, people will see it as a viable way to win Chests, and casual players on a budget may want to pick it up. If this deck continues to be good, Carnage Tyrant and Hour of Promise are good candidates to increase in price. Also, keep in mind that 1) there’s a Jund version of this deck running around, and 2) this kind of deck is very flexible in card choices, since they can ramp into a lot of mana very fast. Keep your eyes on mana-sink cards in the format for possible upgrades. I hope this week’s topic was helpful. Feel free to leave your opinions in the comment section below! Alright guys, that’s all for the week. Thanks for reading, and I’ll see you again next week. Adrian started playing Magic relatively recently, during Return to Ravnica block. He used to play a lot of paper Magic, but family and work commitments starting at the end of 2016 led to him selling off a large portion of his paper collection to focus on MTGO. He's found speculating on MTGO singles to be a great way to subsidize his gameplay expenses, and he's here to help you go infinite on MTGO!